Comfort Option - Indy’s Most Comfortable Mattress is coming to Bloomington! Attention, Hoosiers! We’re proud to announce that our Store-to-Your-Door program is expanding to include Bloomington, IN. Mattress customization is coming to you. Literally! This is a big deal for several reasons. First, Bloomington now has an unbeatable, new way to buy mattresses . Forget the traditional mattress store. Hold off on the bed-in-a-box. We think we can do better. We’re bringing the mattress store to your door and will custom-make the bed perfectly suited to your body type, sleeping habits, and preferences, right there on the spot. Sounds great, right? What’s more, we also manufacture our own products right here in Indianapolis, IN, which keeps costs and overhead low and gives you, far and away, the best night of sleep for your money. Another reason that expanding to B-Town is a big deal? We’ll be honest. We have a special place in our hearts for the cream and crimson. We’re a third generation IU-family-owned business, and we’re thrilled to bring the products we love to the town we consider our second home. If you live in Bloomington and are interested in a better night’s sleep, you can now schedule a totally-free Store-to-Your-Door appointment directly on our website. 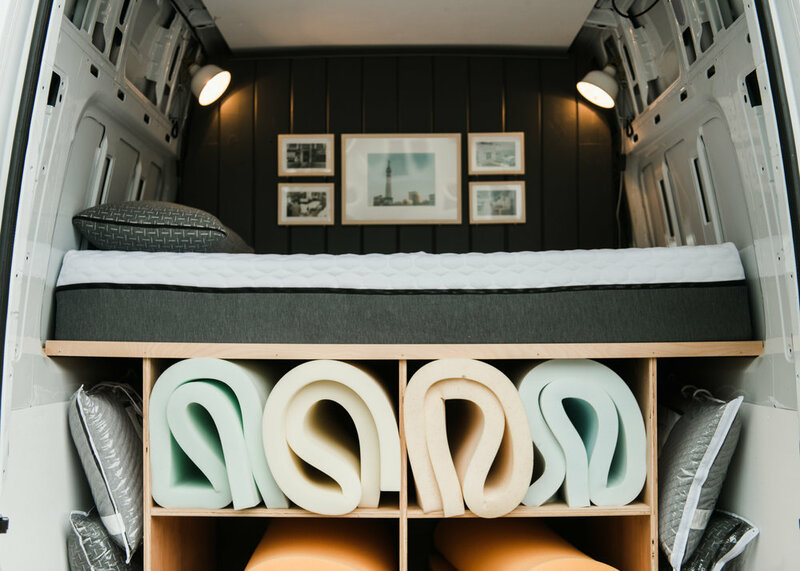 We’ll bring our mobile mattress showroom to you and, if you find a construction you like, will build you the perfect mattress… right there in your driveway! Or apartment parking lot. Or on Kirkwood. Live in Bloomington? Start here.